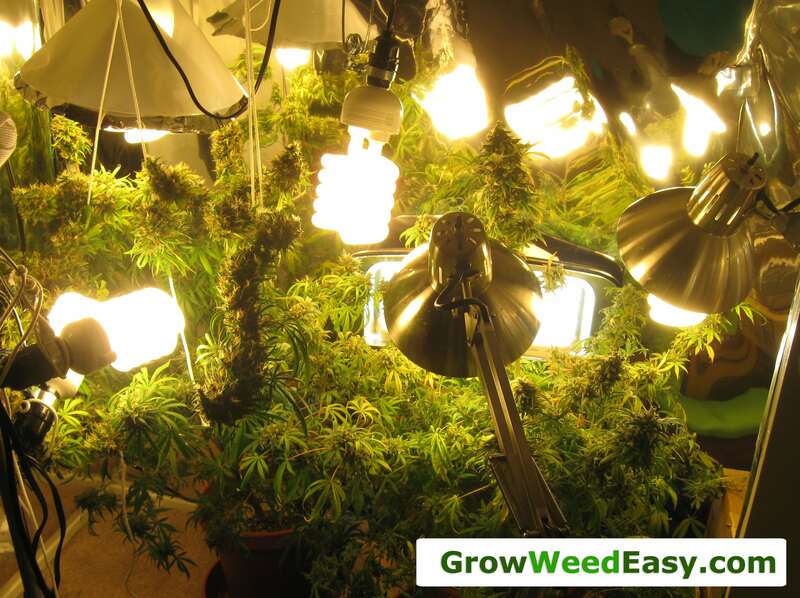 Why Use CFLs to Grow Cannabis? How Many CFLs Do I Need? Complete Supply List: Start Growing Today! When growing cannabis indoors, grow space for a garden is often limited! This is where CFL grow lights shine in every sense of the word! 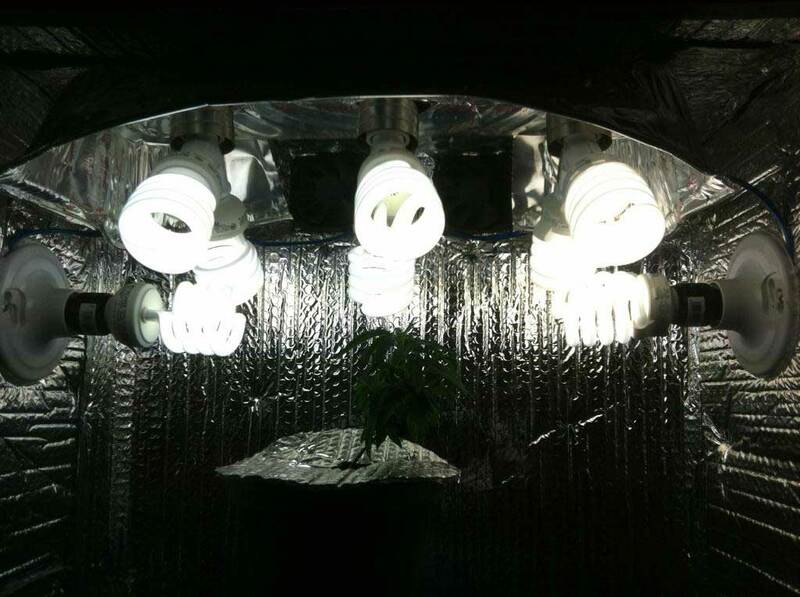 If you have a very small grow space, CFLs may be just what you’re looking for. 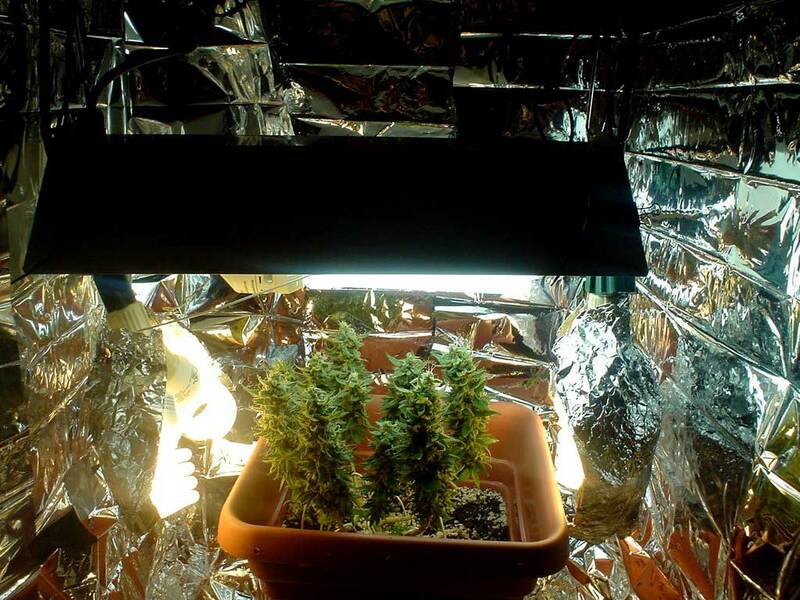 Today, I’d like to share some extra tips and hints for growing cannabis with the super-cheap grow lights which also happen to fit in extremely small spaces… CFLs! Don’t have much space to grow indoors? Try CFLs! CFL stands for “compact fluorescent light” and even though these lights can be found at any hardware or grocery store, they actually give off a really great light spectrum for growing marijuana. Have lots of space; if you have at least 5 feet of height in your grow space, I recommend upgrading to a more efficient grow light. Here’s a picture of one of my very first grows with CFLs. Hint: There are tons of ways to get the most out of your indoor grow space. 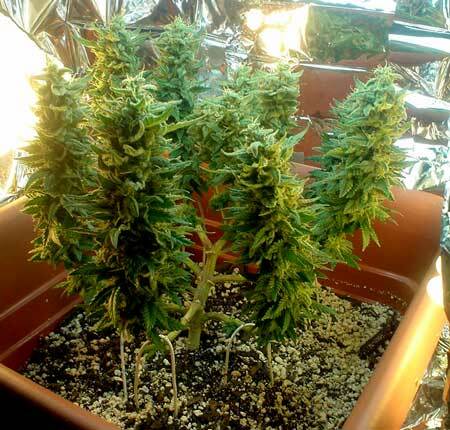 In the past, we’ve covered how to train your cannabis plants to grow into a short “table” shape that is more efficient under grow lights than letting the cannabis plant grow without interference. These cannabis training techniques are especially well suited to growing cannabis with CFL grow lights. You may not want to hear it, but before you do anything related to growing cannabis, you need to make sure you understand the basics of growing cannabis. Skipping this step will cause you all kinds of unnecessary heartbreak! Today I will walk you through the steps of growing cannabis with CFLs, but you’ll get more from this guide if you at least understand the life cycle of a cannabis plant. Taking 20 minutes to read the basics tutorial will answer 95% of the most common cannabis growing questions new growers have. Plus, having a primer will make the learning experience smoother and more fun! 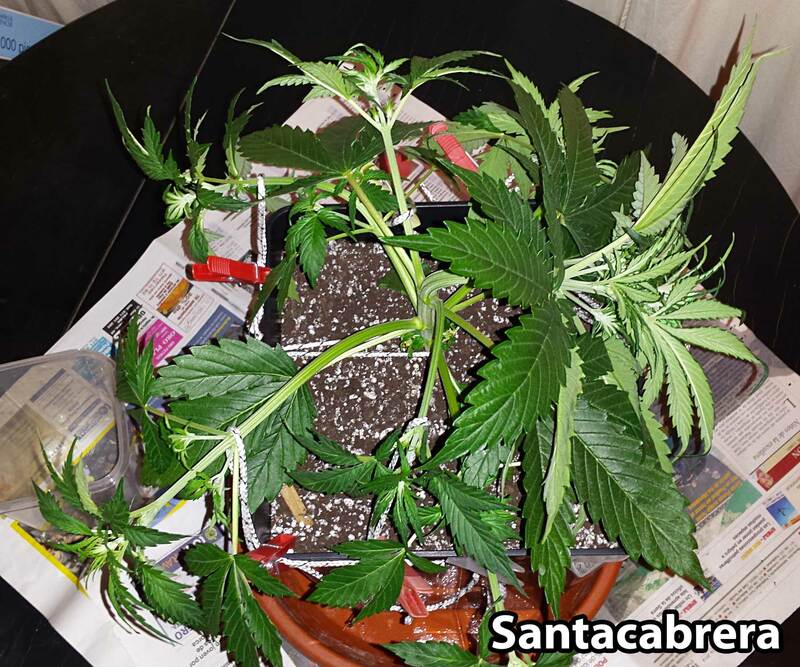 Basically, you need to understand that cannabis plants go from seedling > vegetative stage > flowering stage > harvest. Your job is to give the plant light, water and nutrients, just like any other plant. In the vegetative stage the plant grows only stems and leaves (vegetative growth) while it gets bigger. 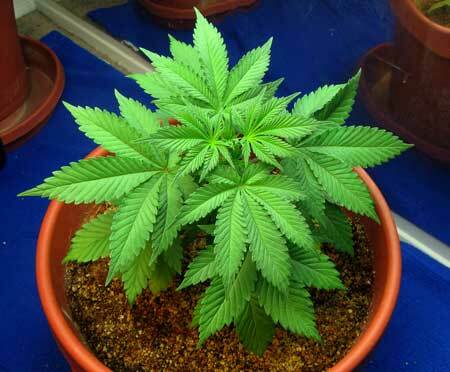 In the flowering stage, the plant eventually stops growing new stems and leaves and starts growing buds. 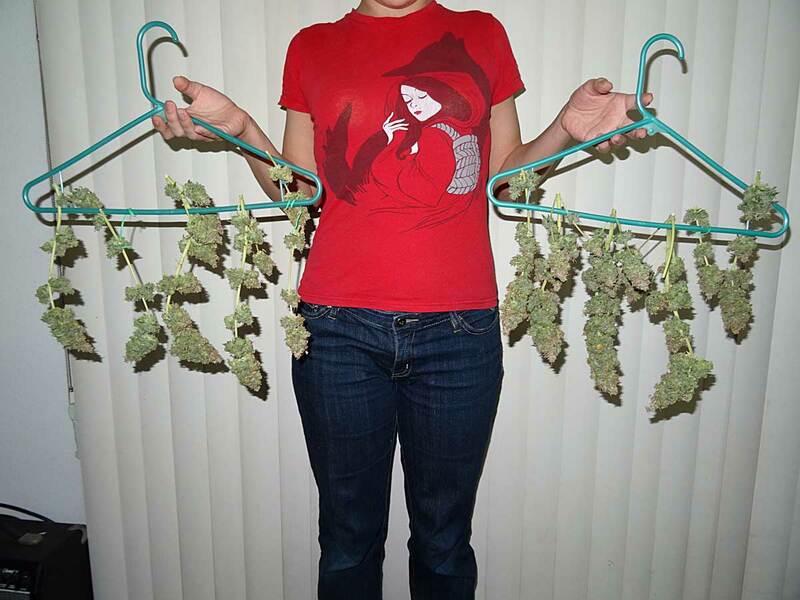 Only female cannabis plants make buds, while male plants make pollen sacs and need to be thrown away immediately. 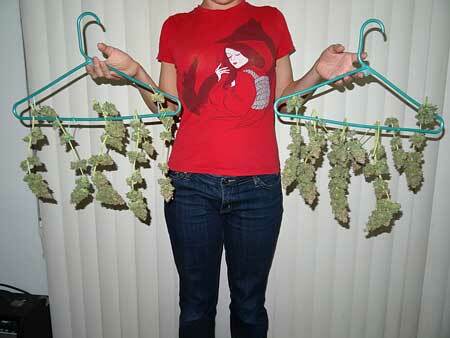 When buds are “ripe” it’s time for harvest. If you feel confused by a lot of that, please take a few minutes to learn the basics of growing cannabis before you proceed to the next step! 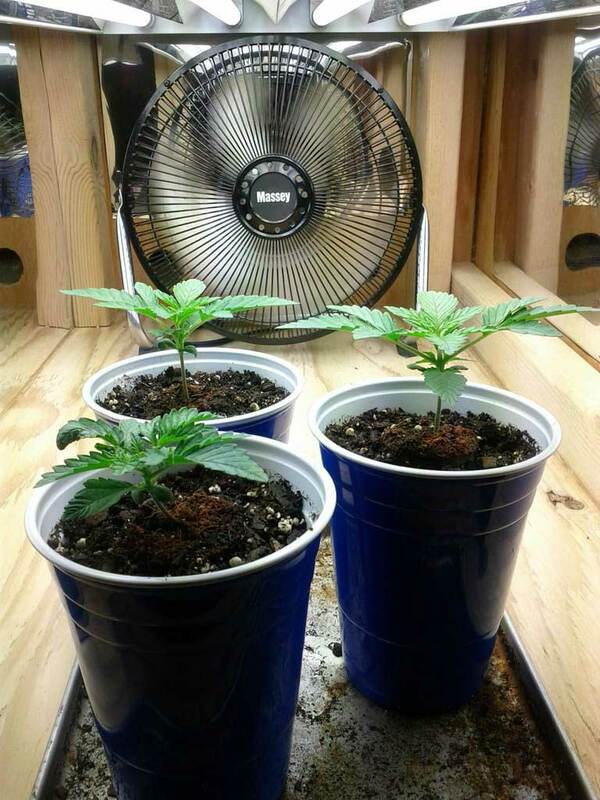 You will need light (CFLs), a place to grow, nutrients and a few other supplies to get started growing cannabis with CFLs. How many and what size CFL grow lights should you get to grow cannabis? Now it’s time to get set up! You can literally put your plants in a closet under your CFLs and go. Although it’s not the best setup, that’s actually what I did for my first grow (see pic!). I did run into problems with heat and ventilation, plus I can’t believe I started growing on a carpet without even putting down a tarp or blanket! But it was a cheap and simple way to get started! Don’t do what I did; never grow on carpet! Always put something down to catch spills! Soon after I started growing, I upgraded my growing environment by getting a grow tent. 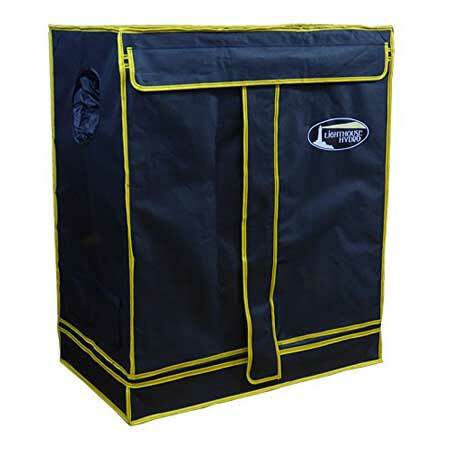 If you want to start out with a turn-key grow space without any work setting up, you might want a grow tent. You can buy a small grow tent that’s perfect for growing cannabis with CFLs! A 2’x2’x4′ grow tent is great for CFLs and will easily fit in the back of your closet. 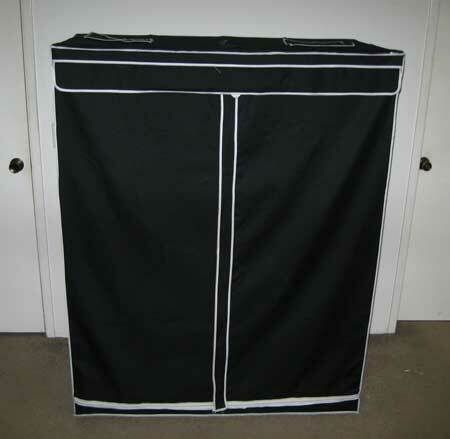 A bigger 2’x4’x5′ grow tent is also be a good starting tent size that can be upgraded with bigger grow lights later. Lots of growers will also build their own grow space, and this can be a good choice especially if you take time to make reflective walls and a way to exhaust heat. 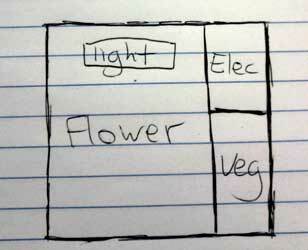 Some growers will include both a vegetative and flowering section, or they might dedicate the whole box to one grow. See this CFL grow journal! These small DIY buckets work well with CFLs. Many new growers already have an idea of where they might grow their plants! Step 4: Start Your Plants! Now it’s time to put real plants into the grow space you have created! Sprout your seeds (learn how to get seeds and germinate them). 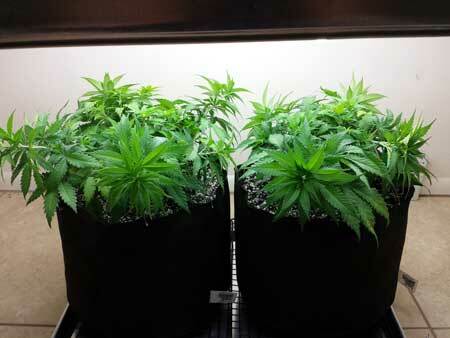 Some lucky growers also have access to clones. Put your timer on an 18-6 schedule so lights are on for 18 hours a day, with a 6 hour dark period. You can set the schedule however you want so it’s most convenient for you. I usually put the dark period during the hottest part of the day to help keep the temperature comfortable for the plant. Learn more about cannabis light schedules. Right after your seeds have germinated, cannabis plants grow just like a normal houseplant. Just give your plants basic care and watch them grow. In the vegetative stage, cannabis really does grow like a weed! Don’t worry, there’s more specific info below! Once your plants get to this size, they are officially in the vegetative stage and should be transplanted into bigger containers before they start getting rootbound. 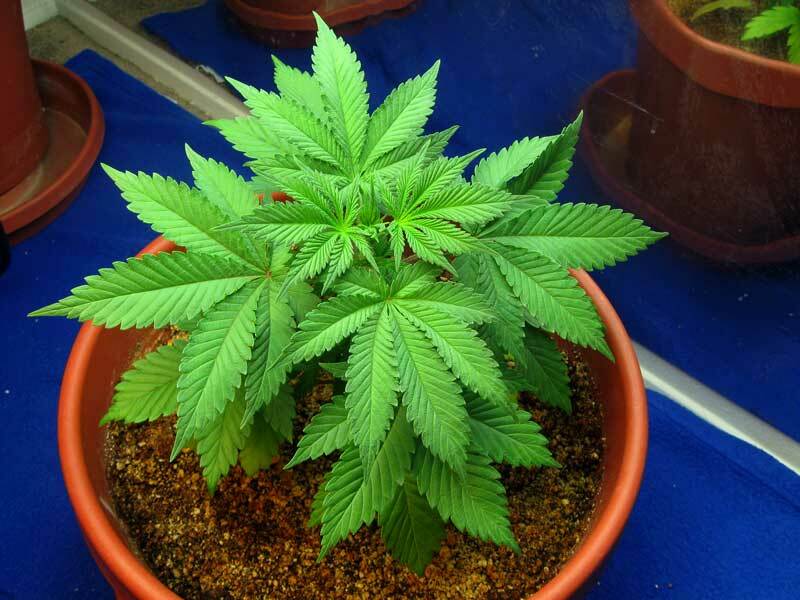 The vegetative stage starts as soon as your young cannabis plant starts growing real leaves. At this point, your plant is only making stems and leaves. It grows just like most houseplants at this stage, so your main job is just to provide water, light and nutrients. Regularly adjust CFL bulbs so they are within 4″ of plants but not burning them. React quickly to any plant problems – most are really easy to fix! A good way to check if a CFL is too close to the plant is to use the “hand test.” Put your hand where the plant is and leave it there for 30 seconds. If it’s too hot for you it’s too hot for your plants and the CFL needs to be moved further away! Plants can grow a lot in a day, so make sure to give yourself some “breathing room” so your plants don’t grow into the bulbs and burn themselves! Even if you choose not to train your plants, keeping your CFLs close will dramatically increase your yields compared to keeping them further away! Keep CFLs Close So the Whole Plant Gets Direct Light! 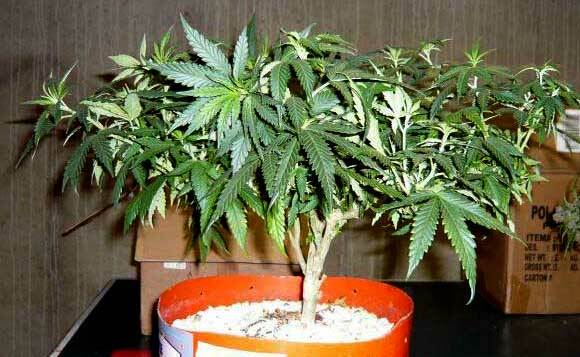 The plant above has been untrained and has grown into the natural “Christmas Tree” shape of cannabis plants. But that’s not the best way to get bigger yields with CFLs. Besides basic plant care, the best way you can increase cannabis yields under CFLs in the vegetative stage is to train your plants to grow short and wide so they’re best able to best take advantage of the CFL’s great light spectrum in the flowering stage. Plant training will dramatically increase your yields! While you don’t have to do training to get to harvest, plant training is actually really easy and will reward you greatly! For biggest yields with CFLs, train plants to grow short and flat using plant training! It’s a good idea to start training when the plant is young, since new stems are flexible and easy to bend (LST). If you start early, you can train your plant to grow flat and wide under your CFL grow lights with only gentle bending and tying down. 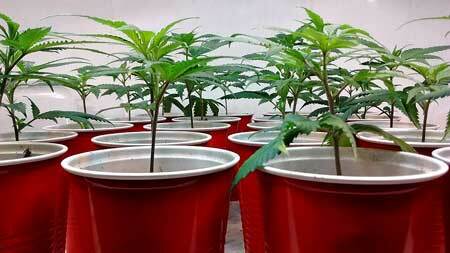 Think about bending any tall stems down and away from the center of the plant. You’re trying to make the top of the plants flat so all the buds are an equal distance from the CFL grow lights. 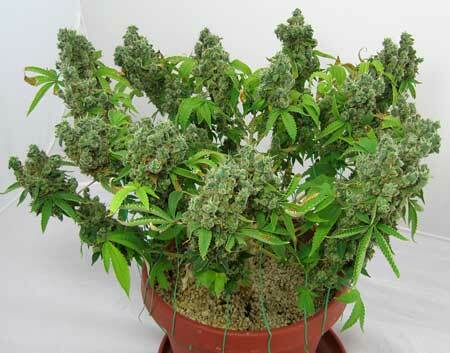 Each bud gets access to lots of light, and will grow bigger as a result! 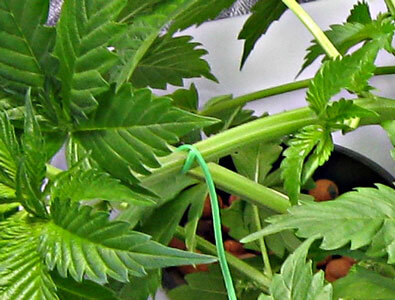 Twisty ties are a convenient way to tie down stems after bending them, but you can use just about anything to tie down plants except for things like string, which are sharp and can cut into the plant over time. Here’s a sneak peak at those cannabis plants after they start making buds – the tabletop shape helps buds get access to the most energy from your CFL grow lights, resulting in chunkier buds and bigger yields with CFLs. This is why we train! This was just a quick walkthrough of marijuana plant training, but you can learn step-by-step how to make cannabis plants grow flat and wide using our LST tutorial! Plant Training – Don’t skip at least basic plant training since it’s extra important for getting good yields with CFLs! 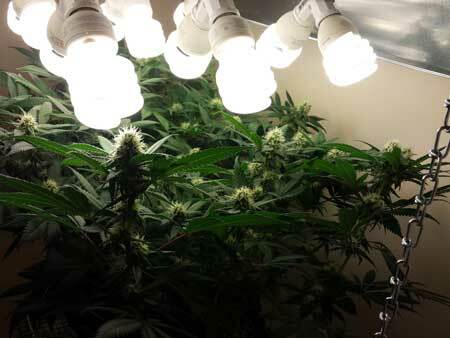 Adjust CFLs Regularly – You want to adjust your CFLs around your plants as they grow, so make it easier on yourself by setting up your CFLs so they can easily be adjusted in your grow space. Keep in mind that CFL adjustment can be a daily task! 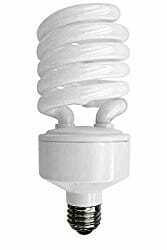 Keep CFLs Close – CFLs should be kept 4″ away from the tops of your plants as long as it’s not too hot (use the hand test). If possible, try to arrange CFLs so all parts of the plant are within 8-10” of a CFL bulb. Avoid Shadowy Areas – If you see a “shadowy” area on the plant, it means you need another bulb there, or need to use bending (LST) to rearrange the shape of the plant so all parts are getting direct light. Don’t Move Plants – Try to avoid moving the plants. 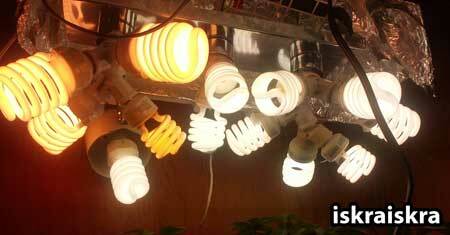 With CFLs you want to train the plant to grow around the lights which is difficult if the plants move every day. 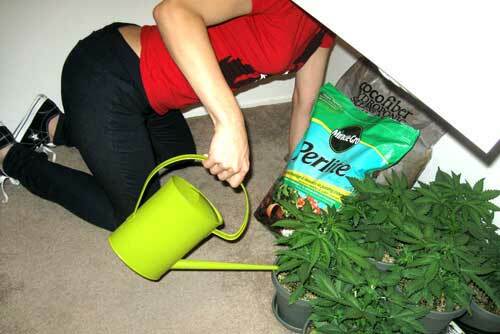 If hand-watering your plant, set up the grow space so you can remove runoff water without having to move the plants. More Light = Better Results with CFLs. In fact you pretty much can’t really give your plant too much light when growing with CFLs (this isn’t true for all grow lights). Switch to the Flowering Stage When Plants Are 1/2 the Final Size – Once plants are half the desired size, use your electrical timer to switch your plants to the flowering/budding stage by changing the light schedule to 12/12. Learn more about cannabis light schedules. 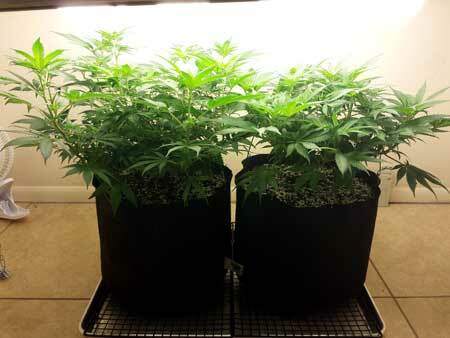 After this switch, most cannabis plants will about double in size before they stop growing taller. In order to switch to the flowering stage you need to switch your CFLs to a 12/12 light schedule using a timer. This means that the plants should get 12 hours of light and 12 hours of dark each day. It’s really important to make sure the plant doesn’t get any light during the dark period. Light leaks cause problems! Your grow space needs to be completely light proof in the flowering stage. About 2 weeks after the switch to 12/12, your plant will start making flowers. If it’s a female plant it will start making buds, but if it’s a male plant it will start making pollen sacs which growers don’t want. It’s important to remove male plants from the grow space right away because they can pollinate your female plant and give you seedy buds. 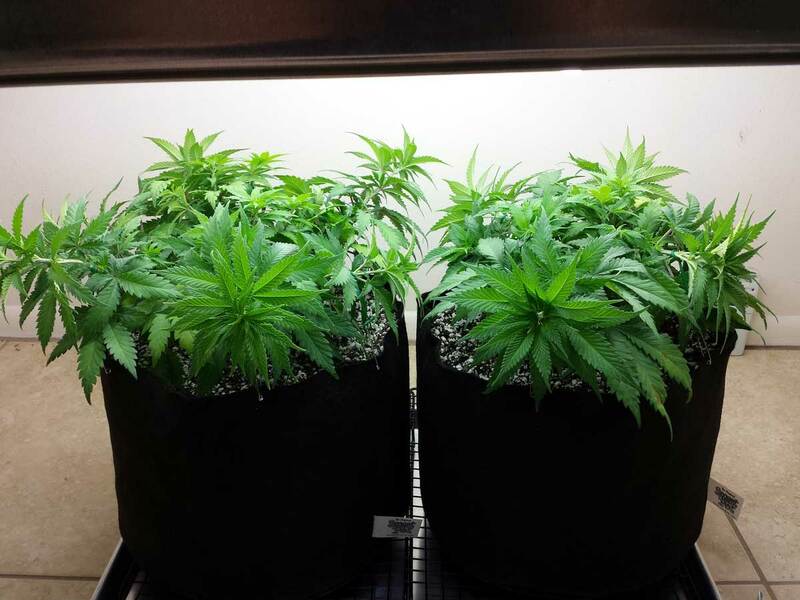 Learn more about male and female cannabis plants. You will thank yourself for training your cannabis plants when you see what happens to all the buds close to the CFL grow lights in the flowering stage! Give Buds Intense Light – In the flowering stage, make sure that buds get direct access to intense light & keep CFLs as close to buds as possible without burning them (this will dramatically increase yields with CFLs). Pay close attention to making sure bulbs are close but not too close in the flowering stage. Give Plants a Comfortable Temperature – Care is basically the same as before, except during the flowering stage it becomes more important to control temperature than ever. If it feels comfortable for you, it’s good for your plants, but if you feel hot, they do too. Cannabis plants are much more finicky in the flowering stage, and it’s easy to trigger problems if you aren’t controlling your environment. Create a Gentle Breeze – Watch over plants closely, and in addition to making every effort to expose all bud sites to light from your CFLs, try to give all your buds and leaves a gentle breeze. This helps the plant grow better as well as prevents various types of mold. 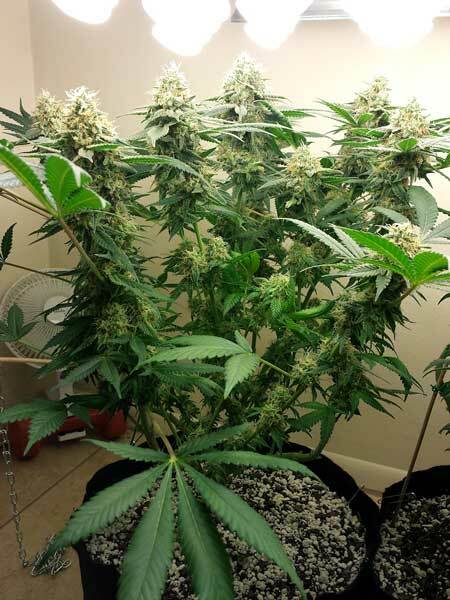 No Bending or Training in the Flowering Stage – In the first few weeks after the switch to 12/12, your plant will still be growing new stems and leaves so you can still train plants by gently bending too-tall colas if the stems feel bendy. 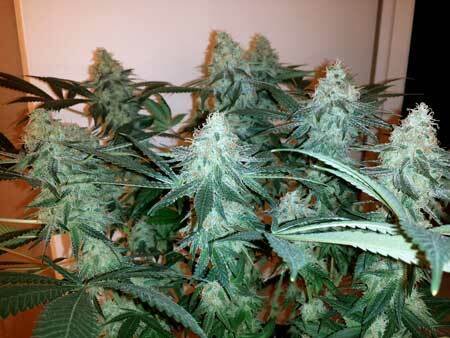 However, it’s important to avoid any more major training once the plant has started making buds. 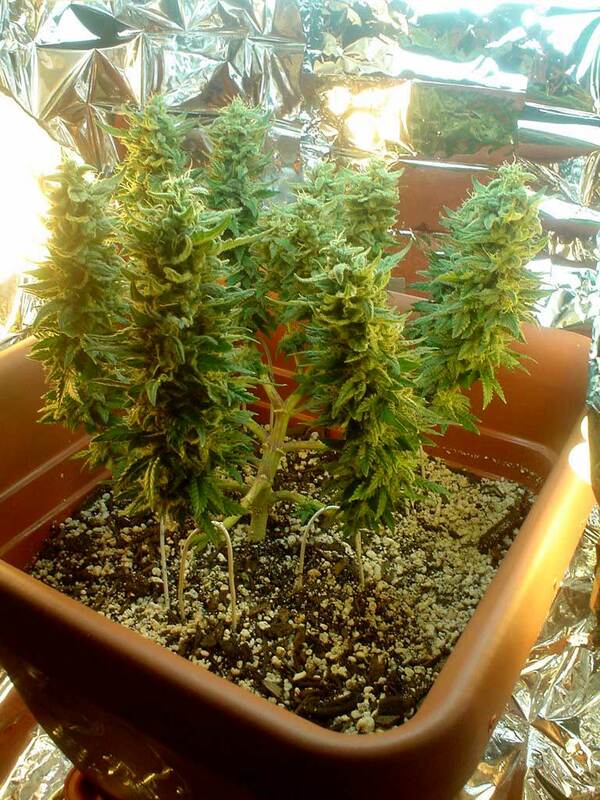 This plant was grown under CFLs, notice how all the buds are about the same height – this helps increase yields with CFLs and gives you many large colas! When plants are mature, it’s time to harvest! Start Growing with CFLs Today! 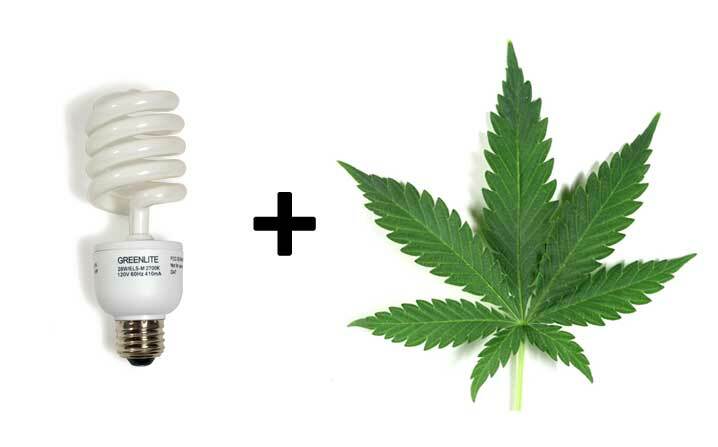 When it comes to CFLs and cannabis you basically can’t give your plant too much light. With more powerful types of grow lights (like HPS or LEDs) you can light-burn your plants even in cool temperatures, like a sunburn. But with CFLs it’s almost incredibly difficult to give too much light so your main job is to get as many bulbs as you can as close to the plants as possible (without burning your plants from heat). Note: Don’t get CFLs confused with old-fashioned incandescent light bulbs! 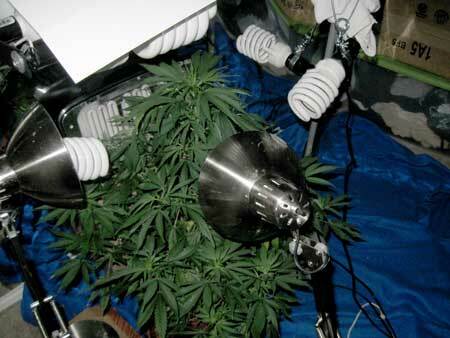 How Many CFLs Do You Need To Grow Marijuana? Because the penetration of CFLs is poor, many many smaller CFLs is more effective than a few big CFLs because they can be spread in an array around the plant. 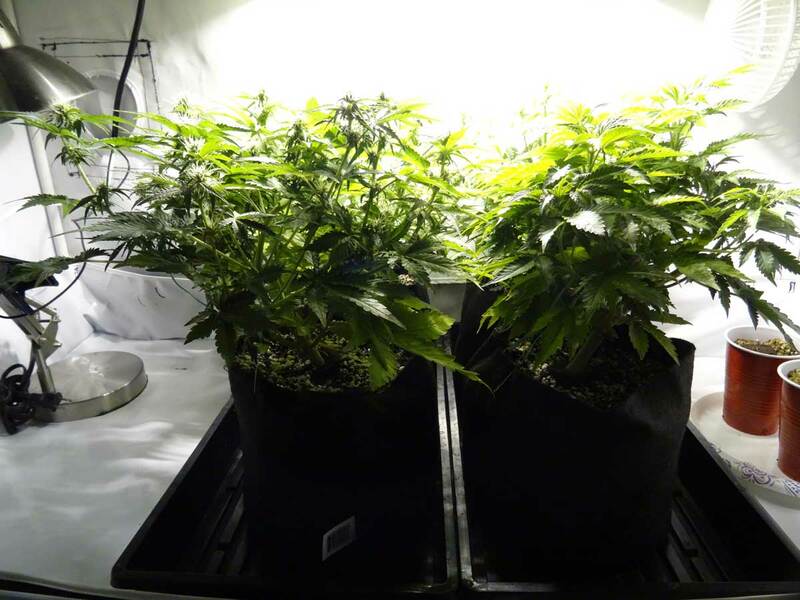 For example, 4 x 40W CFLs (at 160 watts total) will usually get bigger yields than a cannabis plant grown under 1 x 200W CFL, even though the smaller bulbs use less electricity in total. 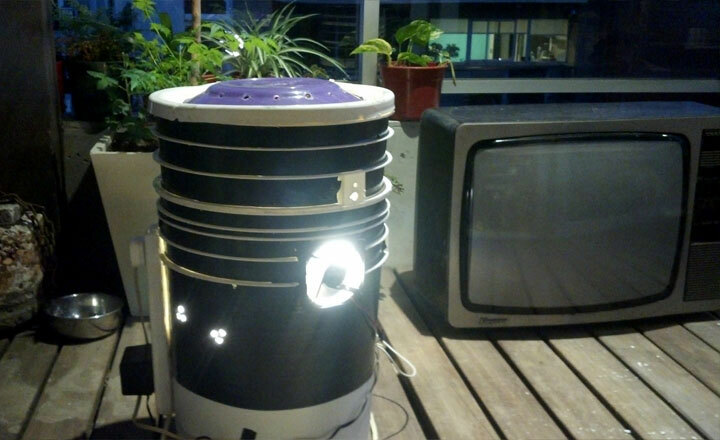 For tiny plants in a small setup like a space bucket you want 20-30W CFLs. 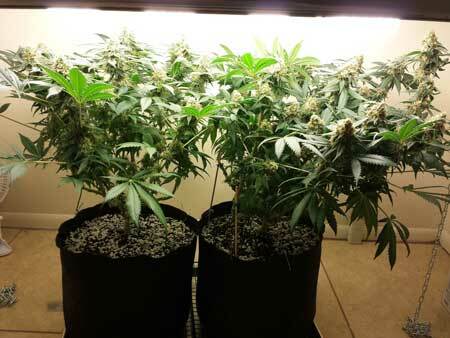 If you plan to grow your plant up to a foot tall, you may want to use 40W CFLs and bigger since the smaller ones won’t have enough penetration to reach the bottom of your plant. 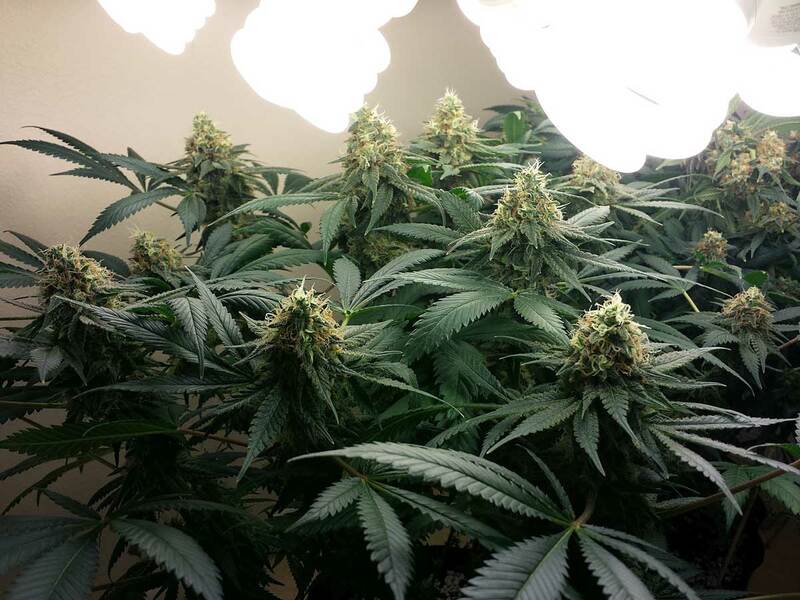 40W-sized CFLs are a great combination of power and penetration when it comes to growing cannabis with CFLs. 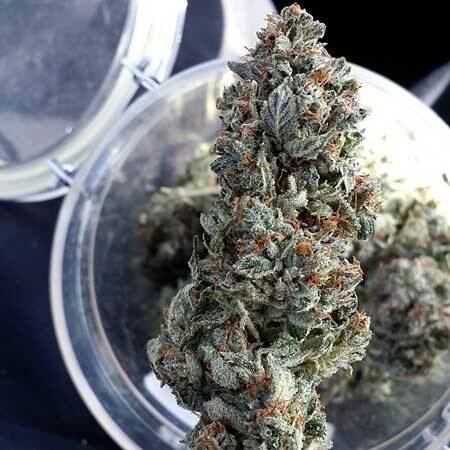 There are bulbs with different CFL color spectrums and it’s generally recommended to get “daylight” (6500k) CFLs for the cannabis vegetative and “soft white” (2700k) CFLs for the flowering stage. Each color spectrum has a small impact on how the plant grows (ex: 6500k encourages slightly more squat growth). But the truth is that total power, or total wattage of your CFLs, is much more important than spectrum with CFL grow lights! At least when it comes to your yields. 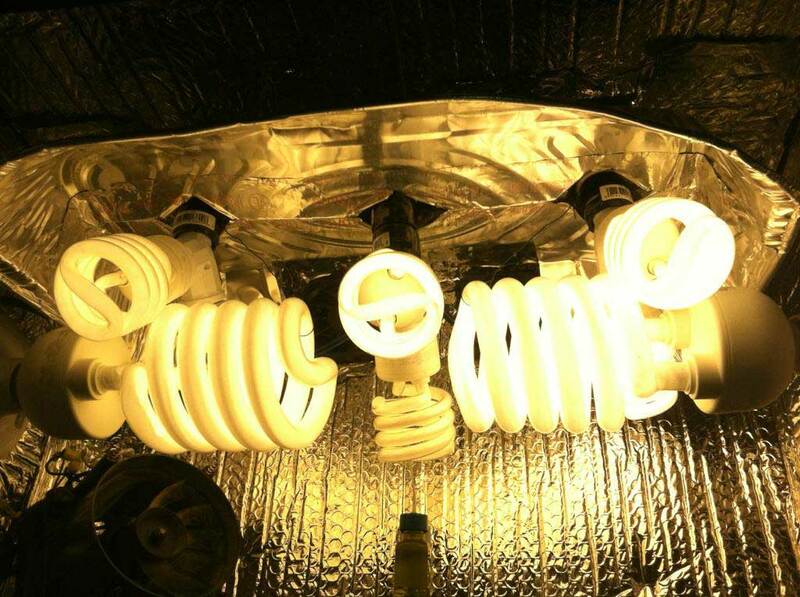 CFLs in any spectrum will do the job! If you do want to get all of one color spectrum, get all “soft white” (2700k) CFLs, or whatever is cheap and can give you the most watts for your money. We will go into much greater detail about CFL color spectrum below, but the main takeaway is that watts is far more important than spectrum! This will help you estimate how much yields to expect from your CFL grow, but you need to remember to take this with a grain of salt. A very general rule of thumb is to expect about 0.25g/watt of CFL light if you use plant training and don’t run into major plant problems. This is counting CFL true watts, not any type of “equivalent” watts. Some CFL growers definitely get bigger yields than that with CFLs, up to about 0.5g/watt for the pros, but 0.25g/watt is what you should expect as an upper limit for a first-time cannabis grower. 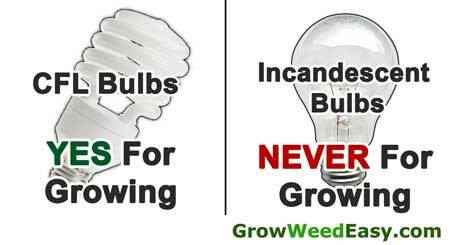 So if you use 150W of CFLs (as recommended to start with each plant below) you can expect about 37.5 grams, or a little over 1 oz per plant. If you add more CFLs for each plant, you will increase your yields somewhat proportionately to how many watts worth of CFLs you add. The size and shape of your plant is going to have the biggest effect on both your cannabis yields and how many CFLs you’ll need. That’s why no “formula” is going to be accurate all the time; marijuana plant training makes such a big difference on your final yields and its impossible to know what a grower’s skills will be. That means any formula is just a rough estimate, but if you follow the steps in this CFL growing tutorial you’ll produce great results every time so you get the cannabis CFL yields you expect, or even more! Examples of Cannabis CFL Setups – How many CFLs Should I Get For Each Cannabis Plant? Don’t want to think about it? Here are example setups as far as how many and what kind of CFLs to get for each marijuana plant! Getting many bulbs tends to work well, but getting all those light sockets and arranging all the lights in an easily adjustable way can be a pain. 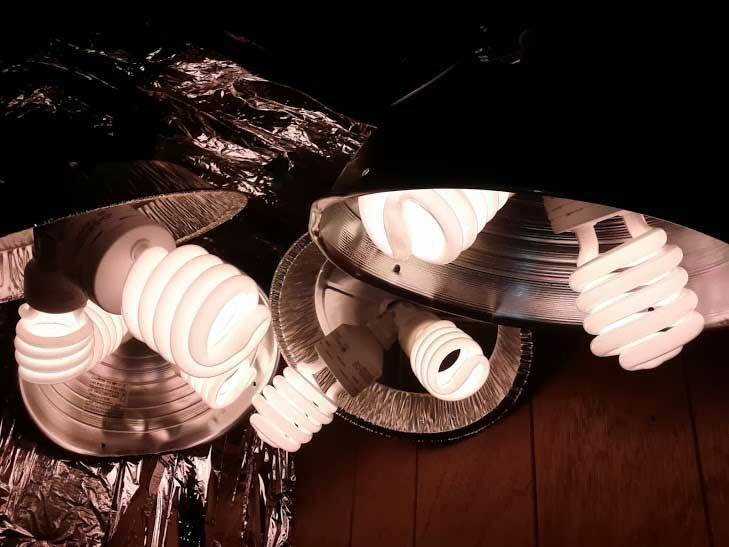 Larger bulb setups let you use fewer bulbs in total to deal with, and have slightly increased penetration, but as they continue to get bigger they become more unwieldy and start generating a lot of heat. 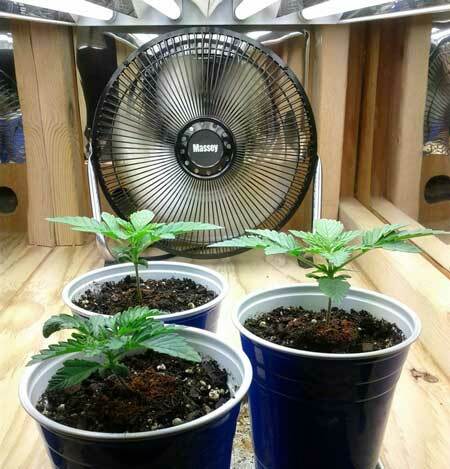 A grower can expect a little over 1oz/plant with each of these CFL Setups, as long as they take great care of their plants, and train them to grow short and wide with many colas as outlined above in the step-by-step instructions above in this Growing Cannabis with CFLs Tutorial. D.) Mix & Match! Just aim for about 150W of CFLs in Total Per Plant to Start, and stick to relatively smaller size bulbs if you can! 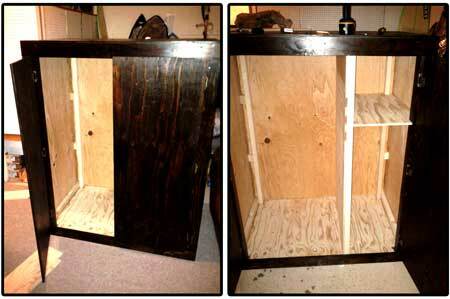 If you want them to screw into regular light bulb sockets, use ones with a “medium base”. When you’re buying CFLs, they come in different “color spectrums.” Some CFLs appear more orange/yellow, some are almost blue, and others almost look like bright white daylight on a sunny day. Having a Bigger Total Wattage is a Lot More Important Than Color Spectrum in CFLs!!! The truth is that all CFLs work for growing, though some can help encourage your plants to grow a certain way by imitating the light of the sun during different seasons…. By using the 6500k colored bulbs during the vegetative stage, you’ll be giving your plants more blue light, which can help a plant grow more short and bushy. However, you can still use bending and training to make your plant grow however short and bushy you want, no matter how it grows! What About (5500K) Photography CFLs? Any CFL will work for growing marijuana. Again, it’s much more important to get a high wattage than the right color spectrum. Wattage = light = yields. I’ve used 5500k photography CFL bulbs in the past and they work great. As far as spectrum is concerned, blue (6500k) encourages shorter vegetative growth, red/yellow (2700K) encourages longer/taller vegetative growth and flowering. The 5500k bulbs are in between. However, they can all be used successfully in all stages of growing. How much light (wattage) will have a much greater affect on your results, and more light/wattage is better with CFLs. 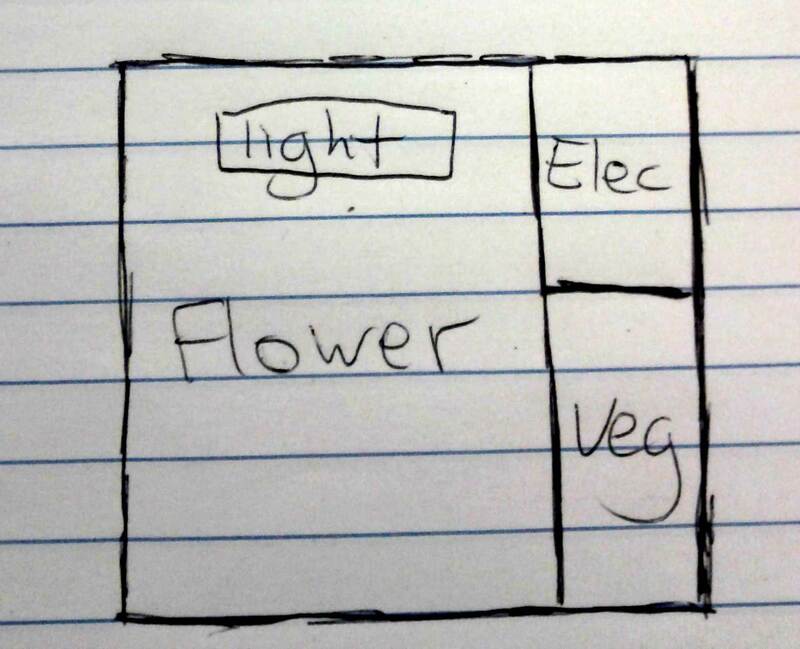 For example, I’d rather have 150W of 5500k bulbs than 100W of 2700k bulbs for flowering. The increased light intensity will help your plants more than getting the exact right color spectrum. The increased wattage will give you more return on yields than getting the proper spectrum, so choose the cheapest CFLs you can get that will give you the most wattage! Make sure to get a light socket for each CFL bulb! 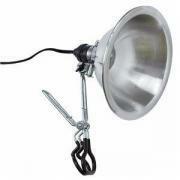 This is what you use to get light to your bulbs from the wall. Get a light socket for each CFL bulb! 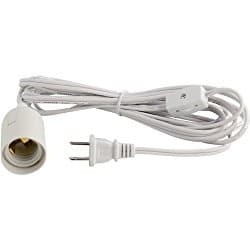 A common method for setting up CFLs is to use a 2-way or 4-way splitter plus a light socket extender to fit more bulbs into a clamp light socket (without the extender, they might not fit inside the reflector). Left – a clamp light socket. 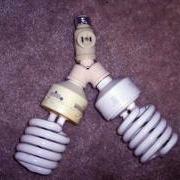 Right – two CFLs on a 2-way splitter on an extender. As a bonus to doubling up, setting up more than one bulb per socket can often be cheaper than buying an individual light socket for each light, especially if you buy online. It also is really convenient for arranging CFL bulbs around your plant. 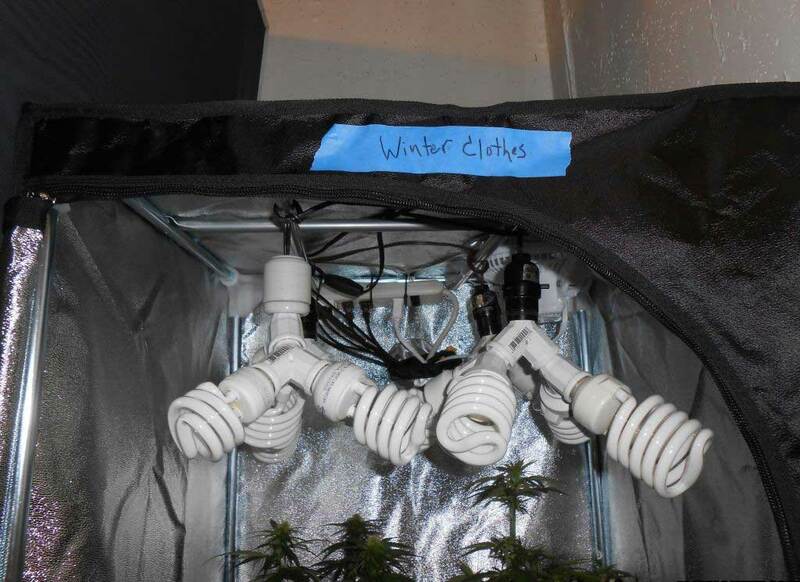 Over the years I’ve seen many creative solutions for setting up CFLs above cannabis plants indoors! A large part of using CFLs is improvising ways to get them in a proper position close to your plants! Light splitters like the following are a helpful way to get more CFLs in a smaller place. They also help you use less total light sockets which can save you some money. 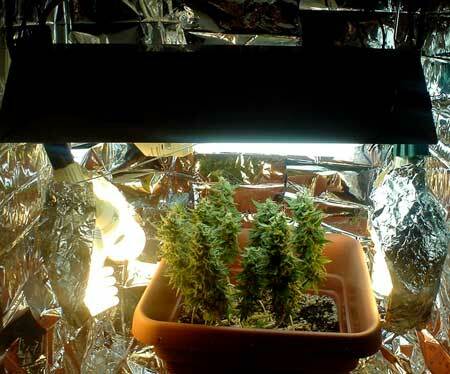 Use the power of reflection to minimize light loss in your marijuana grow space. Cover your walls with something reflective like flat white latex paint (which has 85-95% reflectivity) and/or utilize reflectors to aim more light where you want. Make walls of grow space more reflective to get more light to your plants. A common way to quickly add a lot of reflectivity is to paint walls with flat white latex paint – simply painting your walls with this specific type of paint is really cheap but effective! If you don’t have a good growing space, you can easily buy one that’s perfect for growing cannabis with great reflectivity! 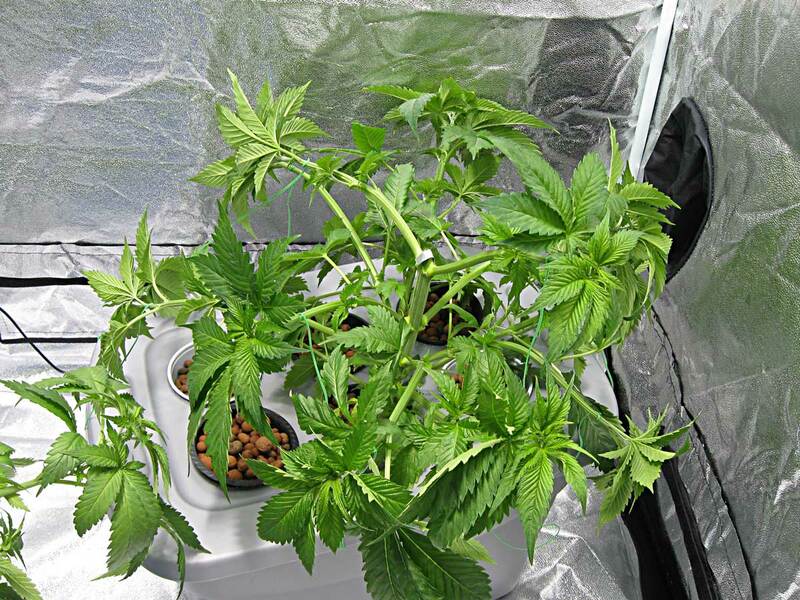 A 2.5’x1.5’x3′ grow tent is great for small spaces when growing cannabis with CFLs. If you have more space, a larger grow tent model will give you a lot more flexibility as far as accessing your plants and being able to arrange your lights.These grow tents are optimized to be as reflective as possible, which increases your yields with the same grow lights. This grow tent is 2’ x 4’ x 5’, which is a good starting tent size that can be upgraded with bigger grow lights later. The inside walls of a grow tent are speficially made to reflect the light from grow lights onto your plants. If you’re not sure, I recommend starting with coco coir since I believe it’s one of the easiest and most forgiving ways to grow marijuana. It’s how I got started and I think it’s the perfect way to learn how to grow cannabis without spending a lot of money. Feel free to read my complete guide to growing cannabis in coco coir with CFLs! Hydro will give you faster growth and bigger yields, and it’s actually not as hard as people make it out to be. Learn more about different growing mediums. If you’re not sure, a simple but effective nutrient system is from Dyna-Gro. It works great for growing cannabis yet it’s cheaper than most cannabis nutrients. 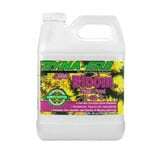 You will need to get a bottle of both Foliage Pro & Bloom. 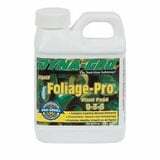 “Foliage Pro” is used during the vegetative stage, and “Bloom” is used in the flowering stage. Dyna-Gro can be used at half-strength (compared to what it says on the bottle) to grow cannabis in soil, water, coco coir, or any growing medium. 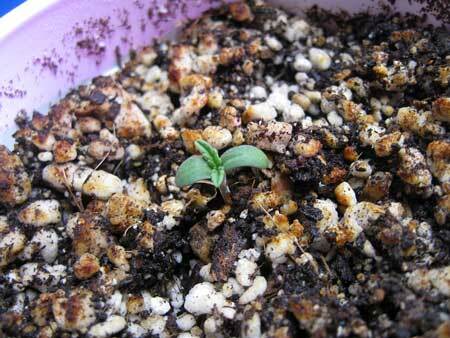 When growing in coco coir, I personally use the General Hydroponics Flora trio plus Calimagic (a Cal-Mag supplement). This is the schedule [PDF] I use with those nutrients. Dyna-Gro Foliage Pro & Bloom cannabis nutrients work great for growing marijuana. Use “Foliage Pro” for the vegetative stage and “Bloom” for the flowering stage (use at half strength compared to what it says on the bottle). 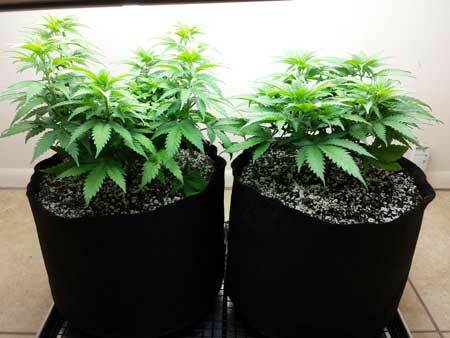 The two-part nutrient system works great for growing cannabis in any grow medium! 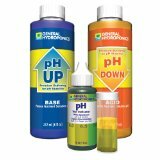 Why does testing pH prevent nutrient deficiencies? 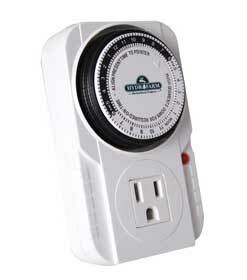 An electrical timer is used to make your lights go on and off on a schedule. 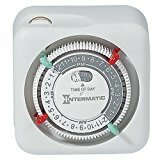 The timer I use cost about $10 and has served me well for years, but any timer will work great! To all you growers on a budget: It’s possible! 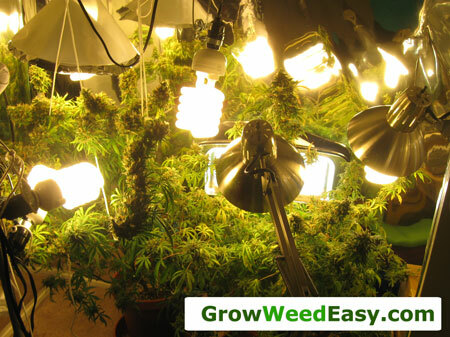 I’m definitely choosing CFLs… if you know you’re ready to get started growing with CFLs, click here to view my step-by-step tutorial on growing weed with CFLs in coco.